Playground Medic is dedicated to making todays playgrounds as safe as possible for todays and tomorrows children - through identification of hazards and maintenance of playgrounds. Over 200,000 children are treated in hospital emergency rooms each year for playground-related injuries. About 45% of these injuries are severe-fractures, internal injuries, concussions, dislocations and amputations. About 75% of the non-fatal injuries related to playground equipment occur on public playgrounds. Most occur at schools and day care centers. At Playground Medic, Playground Safety is our business. We provide customers with cost effective solutions to safer playgrounds through Playground Audits, Safety Inspections, Preventative Maintenance, Repairs, Training and a variety of parts and supplies including protective surfacing. Keeping playgrounds safer also increases play equipment life, decreases legal exposure and decreases operating costs. In 1995, the Office of Technology Assessment estimated the cost of playground related injuries among children ages 14 and younger to be $1.2 billion. 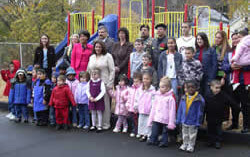 All our inspectors are certified by the National Playground Safety Institute. Our repair staff is trained and we are fully insured. Call our toll free number, 866-332-3133, for a free consultation or email info@playgroundmedic.com. Parks and Recreation on the local, state and national level. We are experienced in all aspects of playground design, installation, maintenance, inspection and repair!